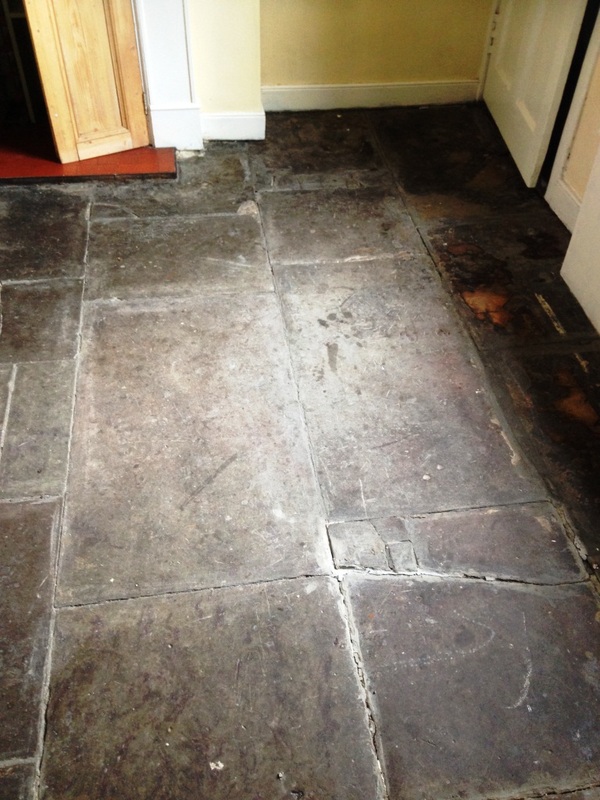 These photographs are of a Flagstone floor tiled floor installed at a house in Glasgow. They were well worn, looking washed out and overdue a deep clean and re-seal, there was also remnants of adhesive and paint and I suspect the floor had been covered in carpet at some point in the past. Working in sections the tiles were covered in Tile Doctor Remove and Go which as the name suggests is designed to safely remove coatings from tiles, this was left to soak in for a while before scrapping off the glue and paint from the stone surface using a wire brush and paint scrapers. The second step was to scrub the floor using a strong dilution of Tile Doctor Pro-Clean worked in using a rotary bonnet machine fitted with a hard nylon brush attachment. The floor was then then rinsed down with clean water and the soiled solution extracted using and industrial wet vacuum. This process was completed three to four times to ensure all the dirt was removed. 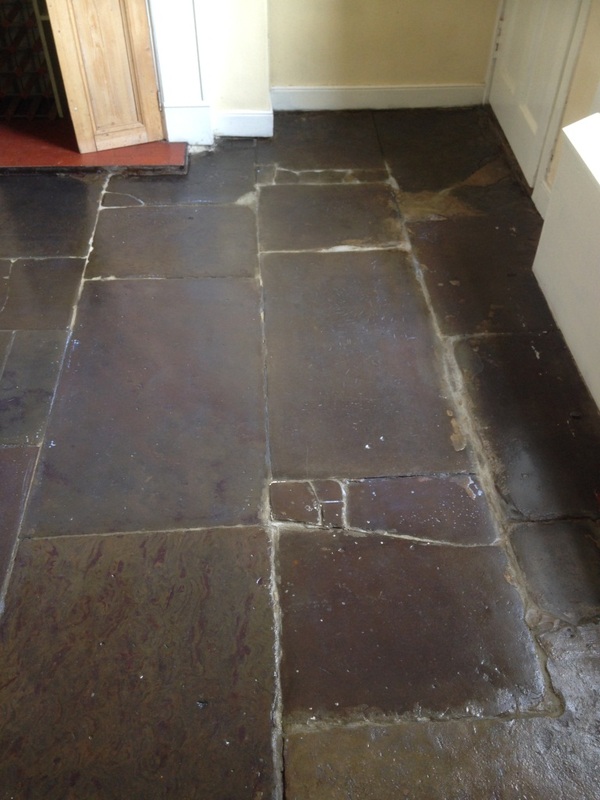 The floor was then left to dry assisted by a turbo air mover and damaged pointing and cracks between the stone was patched up using a sand/cement mortar. The cleaning and repairing process took most of the day so once complete we left for the day leaving the turbo air mover switched on to ensure the floor would be nice and dry of the next day. 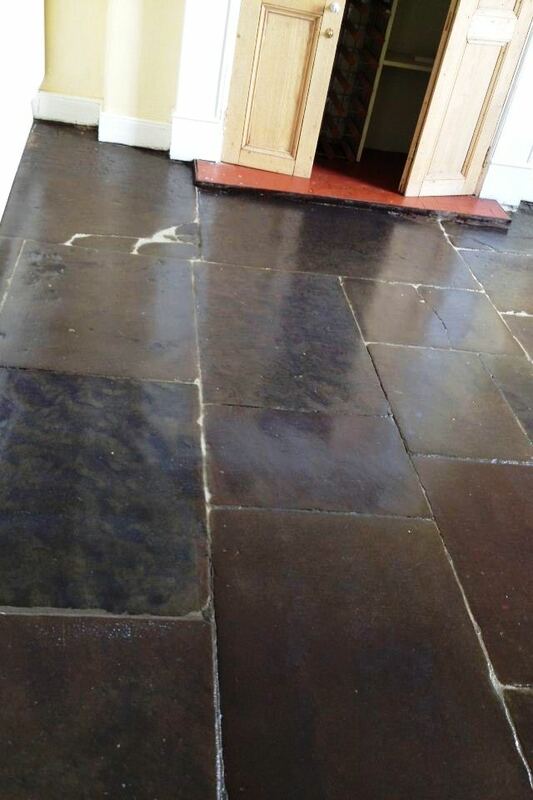 We returned the next day and once we had checked the stone had dried we proceed to seal it using five coats of Tile Doctor Seal and Go which will protect the floor and also adds a nice sheen to the tile. 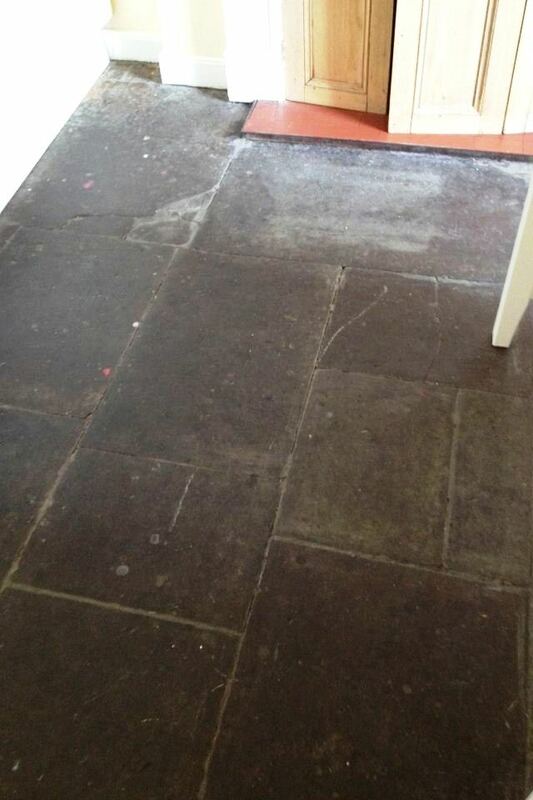 This entry was posted in Work History and tagged cleaning services, deep cleaning, flagstone tile cleaning, flagstone tiles, floor restoration, Glasgow, sealing flagstone, tile cleaning, tile maintenance, tiled floor by Steve Thomson. Bookmark the permalink. Great transformation and interesting use of mortar for grout, now you don’t see that very often but of course in the old days that’s all they had and even wall tiles would be stuck on to a thick bed of mortar.